Thule Air Base, or Thule Air Base/Pituffik Airport (IATA: THU, ICAO: BGTL), is the United States Air Force's northernmost base, located 1,207 km (750 mi) north of the Arctic Circle and 1,524 km (947 mi) from the North Pole on the northwest coast of the island of Greenland. Thule Air Base is the US Armed Forces' northernmost installation. Thule's arctic environment includes icebergs in North Star Bay, two islands (Saunders Island and Wolstenholme Island), a polar ice sheet, and Wolstenholme Fjord – the only place on Earth where four active glaciers join together. Thule Air Base is home to the 21st Space Wing's global network of sensors providing missile warning, space surveillance and space control to North American Aerospace Defense Command (NORAD) and Air Force Space Command (AFSPC). Thule Air Base is also home to the 821st Air Base Group and is responsible for air base support within the Thule Defense Area for the multinational population of "Team Thule". The base hosts the 12th Space Warning Squadron (12 SWS) which operates a Ballistic Missile Early Warning System (BMEWS) designed to detect and track ICBMs launched against North America. Thule is also host to Detachment 1 of the 23rd Space Operations Squadron, part of the 50th Space Wing's global satellite control network. The airfield's 10,000-foot (3,000 m) runway handles more than 3,000 US and international flights per year. Finally, Thule is home to the northernmost deep water port in the world. Thule is the only Air Force Base with an assigned tugboat. The tugboat is used to assist ship movements in the harbor during the summer and is hauled onto shore during the winter season. The tugboat is also used for daily sightseeing tours of Northstar Bay during the summer. Additionally, for a fee, there is a Danish tour boat that runs in the summer. Thule Air Base has served as the regional hub for nearby installations, including Cape Atholl (LORAN station), Camp Century (Ice Cap Camp), Camp TUTO (Ice Cap Approach Ramp and Airstrip), Sites 1 and 2 (Ice Cap Radar Stations), P-Mountain (radar and communications site), J-Site (BMEWS), North and South Mountains (research sites), and a research rocket firing site. It also was essential in the construction and resupply of High Arctic weather stations, including CFS Alert (Alert Airport) and Station Nord. ✪ "TOP OF THE WORLD--Thule Air Base, Greenland.."
"Thule" is named for Ultima Thule (Latin, "farthest Thule"), a medieval name for the land farthest to the north. The name Thule comes from (Greek: Θούλη), a place name dating to the third-century BC for a land believed by the Greeks to lie to the north of Britain. Unlike the Latin pronunciation, however, the air base is pronounced using the Scandinavian pronunciation with an initial hard T (/ˈtuːliː/) rather than the Latin (and Greek) soft th (/ˈθjuːliː/). In 1818, Sir John Ross's expedition made first contact with nomadic Inuktun in the area. James Saunders's expedition aboard HMS North Star was marooned in North Star Bay 1849–50 and named landmarks. Robert Peary built a support station by a protected harbor at the foot of iconic Mount Dundas in 1892. It served as a base camp for his expeditions and attracted a permanent population. In 1910 explorer Knud Rasmussen established a missionary and trading post there. He called the site "Thule" after classical ultima Thule; the Inuit called it Umanaq ("heart-shaped"), and the site is commonly called "Dundas" today. The United States abandoned its territorial claims in the area in 1917 in connection with the purchase of the Virgin Islands. Denmark assumed control of the village in 1937. A cluster of huts known as Pituffik ("the place the dogs are tied") stood on the wide plain where the base was built in 1951. (A main base street was named Pituffik Boulevard.) The affected locals moved to Thule. 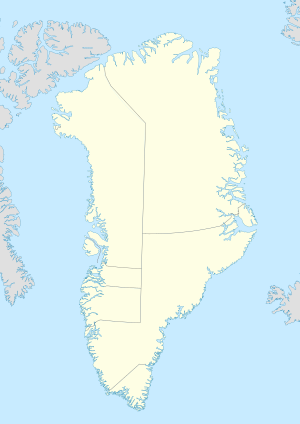 However, in 1953 the USAF planned to construct an air defense site near that village, and in order to limit contact with soldiers, the Danish government relocated "Old Thule" with about 130 inhabitants to a newly constructed, modern village 60 miles (97 km) north, known as Qaanaaq, or "New Thule". In a Danish Supreme Court judgment of 28 November 2003 the move was considered an expropriative intervention. During the proceedings it was recognized by the Danish government that the movement was a serious interference and an unlawful act against the local population. The Thule tribe was awarded damages of 500,000 kroner, and the individual members of the tribe who had been exposed to the transfer were granted compensation of 15,000 or 25,000 each. A Danish radio station continued to operate at Dundas, and the abandoned houses remained. The USAF only used that site for about a decade, and it has since returned to civilian use. Knud Rasmussen was the first to recognize the Pituffik plain as ideal for an airport. USAAF Colonel Bernt Balchen, who built Sondrestrom Air Base, knew Rasmussen and his idea. Balchen led a flight of two Consolidated PBY Catalina flying boats to Thule on 24 August 1942 and then sent a report advocating an air base to USAAF chief Henry "Hap" Arnold. However, the 1951 air base site is a few miles inland from the original 1946 airstrip and across the bay from the historical Thule settlement, to which it is connected by an ice road. The joint Danish-American defense area, designated by treaty, also occupies considerable inland territory in addition to the air base itself. After the German occupation of Denmark on 9 April 1940, Henrik Kauffmann, Danish Ambassador to the United States, made an agreement "In the name of the king" with the United States authorizing the United States to defend the Danish colonies on Greenland from German aggression – this agreement faced Kauffmann with a charge of high treason by the protectorate Government. The first US-sponsored installations at Thule were established after the US Secretary of State Cordell Hull and the defected Danish Minister to the United States Henrik Kauffmann signed The Agreement relating to the Defense of Greenland in Washington, D.C. on the symbolically chosen date of 9 April 1941. The treaty, denounced by the Danish government, allowed the United States to operate military bases in Greenland "for as long as there is agreement" that the threat to North America existed. Beginning in the summer of 1941, the US Coast Guard and the War Department established weather and radio stations at Narsarsuaq Airport (Bluie West-1), Sondrestrom Air Base (Bluie West-8), Ikateq (Bluie East Two), and Gronnedal (Bluie West-9). In 1943 the Army Air Forces set up weather stations Scoresbysund (Bluie East-3) on the east coast around the southern tip of Greenland, and Thule (Bluie West-6) to be operated by Danish personnel. Many other sites were set up, but BW-6, isolated in the far North, was then of very minor importance. After liberation, Denmark ratified the Kauffmann treaty but began efforts to take over US installations. Nonetheless, in summer 1946, the radio and weather station was enhanced with a gravel airstrip and an upper-air (balloon) observatory. This was part of an American-Canadian initiative to construct joint weather stations in the High Arctic. This station was under joint US-Danish operation. The location changed from the civilian village at Thule (Dundas) to mainland Pittufik. In 1946–1951, the airstrip played an important role in Arctic resupply, aerial mapping, research, and search-and rescue. In 1949, Denmark joined NATO (North Atlantic Treaty Organization) and abandoned its attempt to remove the United States bases. By the outbreak of the Korean War next year, the USAF embarked on a global program of base-building in which Thule (at the time) would be considered the crown jewel owing to its location across the Pole from the USSR, as well as its merit of being the northernmost port to be reliably resupplied by ship. Thule became a key point in American nuclear retaliation strategy. Strategic Air Command (SAC) bombers flying over the Arctic presented less risk of early warning than using bases in the United Kingdom. Defensively, Thule could serve as a base for intercepting bomber attacks along the northeastern approaches to Canada and the US. A board of Air Force officers headed by Gordon P. Saville made a recommendation to pursue a base at Thule in November 1950. It was subsequently supported by the Joint Chiefs of Staff and approved by President Truman. To replace the agreement entered into during World War II between the US and Denmark, a new agreement with respect to Greenland was ratified on 27 April 1951 (effective on 8 June 1951). At the request of NATO, the agreement became a part of the NATO defense program. The pact specified that the two nations would arrange for the use of facilities in Greenland by NATO forces in defense of the NATO area known as the Greenland Defense Area. Thule AB was constructed in secret under the code name Operation Blue Jay, but the project was made public in September 1952. Construction for Thule AB began in 1951 and was completed in 1953. The construction of Thule is said[by whom?] to have been comparable in scale to the enormous effort required to build the Panama Canal. The United States Navy transported the bulk of men, supplies, and equipment from the naval shipyards in Norfolk, Virginia. On 6 June 1951 an armada of 120 shipments sailed from Naval Station Norfolk. On board were 12,000 men and 300,000 tons of cargo. They arrived at Thule on 9 July 1951. Construction, aided by continuous daylight in summer, took place around the clock. The workers lived on board the ships until quarters were built. Once they moved into the quarters, the ships returned home. On June 16, 1951, the base was accidentally discovered by French cultural anthropologist and geographer Jean Malaurie and his Inuit friend Kutikitsoq, on their way back from the geomagnetic North Pole. Originally established as a Strategic Air Command installation, Thule would periodically serve as a dispersal base for B-36 Peacemaker and B-47 Stratojet aircraft during the 1950s, as well as providing an ideal site to test the operability and maintainability of these weapon systems in extreme cold weather. Similar operations were also conducted with B-52 Stratofortress aircraft in the 1950s and 1960s. In 1954, the 378 m (1,240 ft) Globecom Tower, a tower for military radio communication, was built at Northmountain. At the time of its completion it was the third tallest man-made structure on earth[citation needed] and the tallest structure north of the Arctic Circle in the Western hemisphere. In the winter of 1956/57 three KC-97 tankers and alternately one of two RB-47H aircraft made polar flights to inspect Soviet defenses. Five KC-97s prepared for flight with engines running in temperatures of −50 °F (−46 °C) in order to ensure three could achieve airborne status. After a two-hour head start, a B-47 would catch up with them at the northeast coastline of Greenland where two would offload fuel to top off the B-47's tanks (the third was an air spare). The B-47 would then fly seven hours of reconnaissance, while the tankers would return to Thule, refuel, and three would again fly to rendezvous with the returning B-47 at northeast Greenland. The B-47 averaged ten hours and 4,500 km (2,800 mi) in the air, unless unpredictable weather closed Thule. In that case the three tankers and the B-47 had to additionally fly to one of three equidistant alternates: England, Alaska, or Labrador. All of this sometimes took place in moonless, 24-hour Arctic darkness, December through February. These flights demonstrated the capabilities of the US Strategic Air Command to Soviet Anti-Air Defense. In 1959, the airbase was the main staging point for the construction of Camp Century, some 150 mi (240 km) from the base. Carved into the ice, and powered by a nuclear reactor, PM-2A Camp Century was officially a scientific research base, but in reality was the site of the top secret Project Iceworm. The camp operated from 1959 until 1967. In 1957 construction began on 4 Nike Missile sites around the base, and they and their radar systems were operational by the end of 1958. In 1961, a Ballistic Missile Early Warning System (BMEWS) radar was constructed at "J-Site," 21 km (13 mi) northeast of main base. BMEWS was developed by the RCA Corporation in order to provide North America warning of a transpolar missile attack from the Russian mainland and submarine-launched missiles from the Arctic and North Atlantic oceans. At this time, Thule was at its peak with a population of about 10,000. Starting in July 1965, there was a general downsizing of activities at Thule. The base host unit was discontinued. By January 1968, the population of Thule was down to 3,370. On 21 January 1968, a B-52G bomber carrying four nuclear weapons crashed just outside Thule – see below. Thule is the location where the fastest recorded sea level surface wind speed in the world was measured when a peak speed of 333 km/h (207 mph) was recorded on 8 March 1972 prior to the instrument's destruction. Thule became an Air Force Space Command base in 1982. Today Thule is home to the 821st Air Base Group, which exercises Air Base support responsibilities within the Thule Defense Area. The base hosts the 12th Space Warning Squadron (21st Operations Group, 21st Space Wing), a Ballistic Missile Early Warning Site designed to detect and track ICBMs launched against North America. Missile warning and space surveillance information flows to NORAD command centers located at Peterson Air Force Base, Colorado. Thule is also host to Detachment 1 of the 23rd Space Operations Squadron, part of the 50th Space Wing's global satellite control network, as well as operating many new weapons systems. In addition, the airfield boasts a 3,047 by 42 m (9,997 by 138 ft) asphalt runway, with 3,000 US and international flights per year. A delegation from the NATO Parliamentary Assembly visited Thule in early September 2010 and were told by the base commander that, at that time (summer), approximately 600 personnel were serving at Thule, a mix of mostly US and Danish active duty personnel and contractors. There is only a brief period each year in the summer when sea ice thins sufficiently to send supply ships to the base. The US sends one heavy supply ship each summer in what is called Operation Pacer Goose. In 1954 a Douglas C-124C Globemaster II operated by the US Air Force crashed on approach to the air base, killing ten people. On 21 January 1968, a B-52G Stratofortress from the 380th Strategic Aerospace Wing, Plattsburgh Air Force Base, New York, on a secret airborne nuclear alert crashed and burned on the ice near Thule Air Base. The impact detonated the high explosives in the primary units of all four of the B28 nuclear bombs it carried, but nuclear and thermonuclear reactions did not take place due to the PAL and fail-safe mechanisms in the weapons. More than 700 Danish civilians and US military personnel worked under hazardous conditions, the former without protective gear, to clean up the nuclear waste. In 1987, nearly 200 of the Danish workers tried unsuccessfully to sue the United States. Kaare Ulbak, chief consultant to the Danish National Institute of Radiation Hygiene, said Denmark had carefully studied the health of the Thule workers and found no evidence of increased mortality or cancer. The Pentagon maintained that all four weapons had been destroyed. Although many of the details of the accident are still classified, some information was released by the US authorities under the Freedom of Information Act. After reviewing these files, an investigative reporter from BBC News claimed in May 2007 that the USAF was unable to account for one of the weapons. In 2009, the assertions of the BBC were refuted by a Danish report after a review of the available declassifed documentation. Ocean Transportation is provided by Schuyler Line Navigation Company, a US Flag Ocean Carrier. Schuyler Line operates under government contract to supply sustainment and building supplies to the Base. Thule is an unincorporated enclave within Avannaata municipality in northern Greenland. The permanent population of the base was 235 as of 1 January 2005. ^ "821st Air Base Group". Peterson Air Force Base. Retrieved 2017-11-07. ^ Gilberg, Rolf. "Thule" (pdf). Retrieved 2012-07-13. ^ Malaurie, Jean (April 5, 1996). Les derniers rois de Thulé. Plon, collection Terre Humaine. ISBN 9782259184670. Retrieved 18 January 2018. ^ "FAQ: Tornado history, climatology". USA Today. 1 November 2007. Retrieved 2012-07-13. ^ "Two of Thule's Extreme Storms". Air Force Weather Observer. Air Force Weather Agency. 9 November 2009. Retrieved 2012-07-13. ^ NATO Parliamentary Assembly, press release 6 September 2010, 30 August – 4 September 2010, Visit to Denmark, Greenland and Iceland Archived 28 September 2011 at the Wayback Machine see "full report"; accessed 26 September 2010. ^ Choi, April (9 July 2010). "Ship Heads to Greenland for Once-a-Year Supply Trip". Norfolk Virginian-Pilot. Retrieved 2012-07-13. ^ a b Morgan, Mark; Berhow, Mark A. (2002). Rings of Supersonic Steel: Air Defenses of the United States Army 1950-1979: an Introductory History and Site Guide. Bodega Bay, California: Hole in the Head Press. p. 168. ISBN 9780615120126. ^ a b Corera, Gordon (10 November 2008). "Mystery of lost US nuclear bomb". BBC News. Retrieved 2008-11-10. ^ Schwartz, Stephen (1998). "Broken Arrows: The Palomares and Thule Accidents". The U.S. Nuclear Weapons Cost Study Project. Brookings Institution. Archived from the original on 9 November 2009. Retrieved 2008-01-22. ^ Kristensen, Hans (2004). "Denmark's Thulegate: U.S. Nuclear Operations in Greenland". Nukestrat.com. Retrieved 2008-01-22. ^ Mulvey, Stephen (11 May 2007). "Denmark challenged over B52 crash". BBC News. Retrieved 2008-01-25. ^ Christensen, Svend Aage (3 August 2009). "The Marshal's Baton. There is no bomb, there was no bomb, they were not looking for a bomb". Danish Institute for International Studies. Archived from the original on 25 May 2012. Retrieved 2009-08-14. This article incorporates public domain material from the United States Air Force document "821st Air Base Group". Balchen, Bernt. Come North With Me. EP Dutton, New York, 1958. Ravenstein, Charles A. Air Force Combat Wings Lineage and Honors Histories 1947–1977. Maxwell Air Force Base, Alabama: Office of Air Force History 1984. ISBN 0-912799-12-9. Wikimedia Commons has media related to Thule Air Base.